An engrossing, thoughtful, helpful book. Whether you lost your spouse or lost your job, navigating grief is often a lonely business. Welcome to The Hot Young Widows Club. 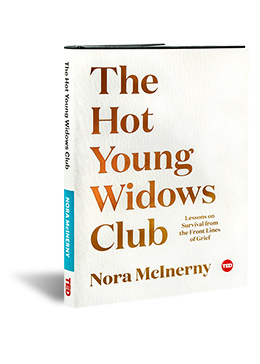 Drawing from her own life experience, Nora McInerny offers a wise, humorous roadmap and caring community for anyone going through a challenging life moment. Here is one important thing we all have in common: literally everyone we know and love will die. That one uplifting and crowd-pleasing fact is not enough to make it easier when it actually happens. Other bad things happen, too, and sometimes they happen in quick succession, as they did to Nora McInerny. In the span of a few weeks, thirty-something Nora lost her husband, her unborn baby, and her father. Her life fell apart, and Nora had to rebuild it herself. In the process, she met thousands of people suffering through their own tragedies, or watching helplessly as their loved one suffered. When everyone is afraid to do or say the wrong thing, nobody does or says anything. Welcome to The Hot Young Widows Club. Maybe you haven’t lost a spouse (yet!). That’s okay. This book is a club of it’s own. Not just for those who have survived a spouse, but for anyone who has loved someone who died, or who has loved someone who loved someone who died. It’s for anyone who currently loves someone who will die, or who knows a person who loves someone who will die. Like it or not, you’ll join someday. Nora McInerny has a lot of jobs. She is the reluctant co-founder of the Hot Young Widows Club (a program of her non-profit, Still Kickin), the best-selling author of the memoirs It’s Okay To Laugh, Crying Is Cool Too, and No Happy Endings and the host of the award-winning podcast Terrible, Thanks for Asking. Nora is a master storyteller known for her dedication to bringing heart and levity to the difficult and uncomfortable conversations most of us try to avoid, and also for being very tall. She was voted Most Humorous by the Annunciation Catholic School Class of 1998.